Unsure what is on offer in August in Madrid? Look no further! Kids in Madrid can suggest some ways to escape the heat and keep entertained. Are you a young family visiting or settling into Madrid this summer? Have you lived here for years but never needed to spend the hottest months of the year in the capital? Unsure what is on offer in August in Madrid? Look no further! Kids in Madrid has been enjoying the summer scene in Madrid for years and can suggest some ways to escape the heat, keep entertained and really enjoy everything this city has to offer whilst the rest of the population are away. Of the 22 outdoor pools owned by the city, only 18 outdoor swimming pool complexes are open this summer. Although many are on the outskirts of town, they are all close to Metro stations and clearly signposted. These complexes are incredibly family friendly, with shallow paddling pools for babies, shaded picnic areas, cafeterias and plenty of staff to keep an eye on you and your belongings. The easiest pools to reach by public transport from the city centre are Vicente del Bosque, Concepción ; Francos Rodriguez, Luis Aragonés and Aluche. The pools are open from 11am and 8pm daily (Mon-Sun). The water park in Villanueva de la Cañada (35km outside of the city) is superb but only accessible by car or by bus, making it quite a daunting trek for tourists. It is probable that by going to Aquopolis this summer you will encounter the only Spanish families that are still in Madrid in August! Be assured that if you do give it a go, your kids will love you for taking them there. Everyone knows that finding shade in the Retiro is relatively easy, although you are likely to share it with many other families when you do. This popular park is the jewel of Madrid’s outdoor spaces and should be visited no matter what time of year. However if you fancy visiting other parks which offer equally good opportunities to sit in the shade and escape the heat, you might like to try the beautiful Parque del Oeste (Metro: Moncloa) with its stunning rose garden and Egyptian temple from where you can enjoy a panoramic view that takes in the nearby Casa de Campo park, the palace and the cathedral. A bit further out of town but worth visiting are Quinta de los Molinos (Metro: Suanzes) and El Capricho (Metro: El Capricho). Both parks are on Metro line 5 which runs from Callao/ Gran Via and promise tranquillity and shade upon arrival. The Quinta de los Molinos park – a favourite of the writer – has only 4 entrances to it, the main one being opposite the Metro station. This makes it a quiet and safe park to visit, away from the hustle and bustle of the Retiro. This park has no amenities, just fresh air and a cool breeze. Children love the long paths which are great for riding scooters along. The duck pond is fun too. The Capricho, on the other hand, as the most picturesque and landscaped garden open to the public in Madrid, does not allow wheels (except for pushchairs) or balls and you are not allowed to take a picnic either. Nevertheless, it is a delight to visit and children are fascinated by the follies. There is a reasonably priced cafeteria opposite the park and there are drinking fountains within. From mid-July to mid-August a meteor shower sporadically lights up the night sky across Madrid and most of Spain. In 2018 the closest it will be to Earth will be on Sunday 12th of August from midnight to 4am. Those families with cars travel to viewing points in Robledo de Chavela, Navas del Rey and Valdemorillo to see the display with hundreds of other spectators. 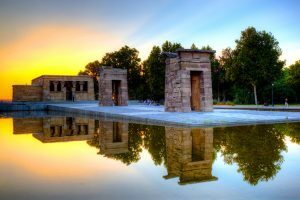 Those without transport usually gather in the Parque de Juan Carlos I or next to Templo de Debod in Parque Oeste to enjoy this natural phenomenon. Madrid is made up of 21 districts, each with its own characteristics, celebrations and festivities. From the 29th of June to the 2nd of September it is possible enjoy free entertainment across the length and breadth of the capital in the aptly name Veranos de la Villa initiative, sponsored by the city council. Expect flamenco, expect classical and pop concerts, expect fireworks displays and expect fun and laughter for all ages throughout every evening and well into the night. Of special interest are those that take place over the first fortnight of August in the city centre. Festivities begin in the Rastro/ Embajadores area of the city centre (from 2nd to 8th of August), then move to Lavapies (from 9th to 11th of August), with a grand finale in La Latina for the Paloma festivities from 12th to 15th of August. Choose any of these traditional festivals and enjoy street musicians, tapas, freshly made lemonade, crafts and delicacies from all over the region. Groups visiting Madrid with children or teens may be interested in contacting Madrid and You who offer entertaining and unique private tours of the city in English from 200 euros. And just remember the plus side about being in Madrid in August is that it is empty! Take a look at our blog on the natural water spots in and around Madrid to escape the heat for a bit. What maternity or paternity leave can parents take in Spain?